Dr Sabine Jacques, Lecturer in IP/IT/Media law at the University of East Anglia, reports on the recent CREATe-UEA event in Norwich. The CREATe Doing it for Yourself event was held at St George’s Works in Norwich on August 29th 2017. 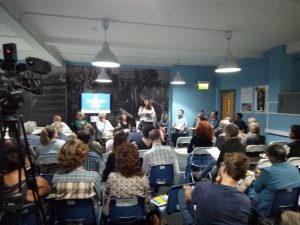 It sought primarily to corroborate UEA’s research findings undertaken under the CREATe umbrella with the community to which they relate, but equally to strengthen connections with that local creative community in order to support and steer future research in this area. Fifty people attended this quickly ‘sold out’ event. Co-organised by the Centre for Competition Policy and Culture Shift Norwich, each “provocation” paired a creator with an academic to discuss a broad range of issues – from creative value to content consumption, including piracy and structural changes in creative industries – followed by an open discussion with the public. The event itself was facilitated by Henry Layte (owner of an independent bookshop, The Book Hive) who chaired the provocations. Introducing the local creative community to CREATe’s interdisciplinary research centre, Professor John Street kicked off the evening by providing a brief history of this consortium and its programme. Additionally, Street took the opportunity to underline the impact of digitalisation on creative industries in the UK, underpinning the research undertaken within CREATe and discussed that evening. First up, Dr Tom Phillips, lecturer in humanities at UEA, was paired with games designer Robin Silcock. They reviewed value in the videogame industry and stressed the importance for game creators of knowing how to discuss the value enshrined in their works with all kinds of stakeholders (e.g. game developers, policy-makers and even end-users) to maximise returns in terms of economic rewards or reputation. Does a videogame need to be a product of art or a product of business to be successful? After all, most of the time, the creator behind the videogame is more comfortable with one rather than the other. Phillips argued that art and business do not have to be competitive values. By looking at tax reliefs (which tend to focus on economic value), Phillips’ findings purport that games’ tax reliefs represent an intersection between economic, political and cultural values. Strengthening Phillips’ argument, Robin explained how difficult the framework imported from the film industry is when it comes to creating videogames and benefitting from tax reliefs. This shoehorning of creativity – by reducing tax relief to a box ticking exercise – makes it hard for a very diverse product like a videogame. Moving on to making money from music in a digital environment, Professor John Street was paired with musician Milly Hirst and Iain Lowery (musician and producer). They discussed how even though the advent of the Internet and new technologies have facilitated music creation and consumption, serious barriers remain in allowing music creators to thrive. This interview-style provocation explored how musicians perceive copyright policy in their day-to-day activities. Does copyright actually help new creators as opposed to popstars? Hirst and Lowery started by confessing that they still feel rather naïve when it comes to copyright law and how difficult it is for non-experts to get their head around the law. Here, creators are much more concerned about ensuring that their works reach the widest possible audience, even through the infringement of one’s copyright, to build a reputation which would allow for commercial success in the future. Professor Morten Hviid reported on the value chain and what the book and music industries look like following digitisation. Have the actors changed? Have record labels really lost power? Is the creator required to become more of an entrepreneur to be successful? As the emergence of new actors and services were facilitated with the development of technologies, former intermediaries have seen their powers decrease and new ones have emerged. Have the morphing of these business models facilitated the thriving of creators in the music and book industries? While the retailing sector concentrated in both industries, there is a rise in opportunities for creators to ‘do it themselves’. Molly Naylor, writer, poet and performer, picked up on the notion of ‘gatekeepers’ and their relevance in the real world, relying on her own experience as a writer with publishers. Although her initial position was to do without so-called gatekeepers, such as a publisher, by challenging the actual financial risks taken, these intermediaries are crucial for wider audience reach, credibility and quality control of creative endeavours. Being a creator and an entrepreneur requires a set of numerous skills that are not accessible to everyone. If creators are required also to be entrepreneurs we might end up in a society with less diverse cultural goods. Therefore, perhaps, gatekeepers are not obsolete but should bear a role in fostering diversity and equal opportunities. Dr Sabine Jacques followed up on this goal of preserving and fostering cultural diversity by exploring the dilemmas of free creative production in the 21st century whilst respecting one’s copyright. Teamed up with the photographer Nick White, Jacques explored the boundaries of creativity under copyright law. By overviewing a series of hypothetical cases, she derives a number of factors influencing whether a particular use will infringe copyright or will merely amount to inspiration. In short, it is important for creators to record the creative workflow behind a particular artwork as well as knowing how to publicly speak about their work, as this may be used in a courtroom later on. White highlighted the discrepancies between the law and the way creators work. He sees other people’s works as ingredients in a recipe enabling him to create new original works. Therefore, it is crucial for creators to engage more with copyright law as copyright ultimately determines how remuneration can be perceived and in which cases a license must be sought to create new works. As one of the biggest issues with digitisation is the emergence of a free culture, the last provocation aimed at understanding why people infringe copyright-protected works. On this occasion, Dr Piers Fleming was paired with Jonathan Blagrove, filmmaker, to discuss what motivates or deters piracy. Although unable to make it in person, Fleming’s work was presented. It concluded that there are two factors that encourage piracy: 1) it is free; 2) the chances of being caught are slim. Therefore, if the cost of being caught is increased, piracy will decrease. Additionally, individuals are less likely to infringe copyright if their moral sensitivities are being appealed to. Consequently, it is important for creators to let their audience know the efforts that went into creating a work. Finally, social norms bear a great role in changing the individual’s behaviour. Blagrove focused on the film industry to underline that piracy is also linked to release dates in different territories, the limited availability of some content and the high prices of cinema tickets. All of these factors contribute to piracy over time. Some recurring themes emerged from this event. For example, there is still a large misunderstanding as to what copyright is and how it functions amongst creators. Additionally, reputation appears as one of the main concerns for creators but equally, although creative industries have been relatively prompt in adapting to the advent of technologies and consumer habits, the position of the creator remains rather unchanged and creators’ concerns ought to feature more prominently in copyright policy debates in the future if we want to establish a sustainable creative environment. From the creators’ perspective, building a strong relationship between the author and the audience remains the most important element. This evening event covered a number of crucial topics making it hard to be summarised in a couple of sentences. The event was filmed and videos will be made available at a later date. Special thanks to Marion Catlin, Laurence Wild, Nikki Neile and all the helpers for ensuring the success of this event.